Curling stress. Differences in temperature between the top and bottom surfaces of a PCC slab will cause the slab to curl. Since slab weight and contact with the base restrict its movement, stresses are created. Load stress. Loads on a PCC slab will create both compressive and tensile stresses within the slab and any adjacent one (as long as load transfer efficiency is > 0). Shrinkage and expansion. In addition to curling, environmental temperatures will cause PCC slabs to expand (when hot) and contract (when cool), which causes joint movement. These three principal responses typically determine PCC slab geometry (typically described by slab thickness and joint design). As slabs get longer, wider and thinner, these responses, or a combination of them, will eventually exceed the slab’s capacity and cause failure in the form of slab cracking, joint widening or blowup. Note that additional issues, notably load transfer stresses and deflections, must also be accounted for in design. There are a variety of ways to calculate or at least account for these responses in design. The empirical approach uses the AASHO Road Test results to correlate measurable parameters (such as slab depth and PCC modulus of rupture) and derived indices (such as the load transfer coefficient and pavement serviceability index) to pavement performance. The mechanistic-empirical approach relates calculated pavement stresses to empirically derived failure conditions. The stresses of primary concern are associated with slab bending either due to temperature gradients, loading or a combination thereof. Since PCC is much stronger in compression than tension, tensile stresses tend to control PCC pavement design. 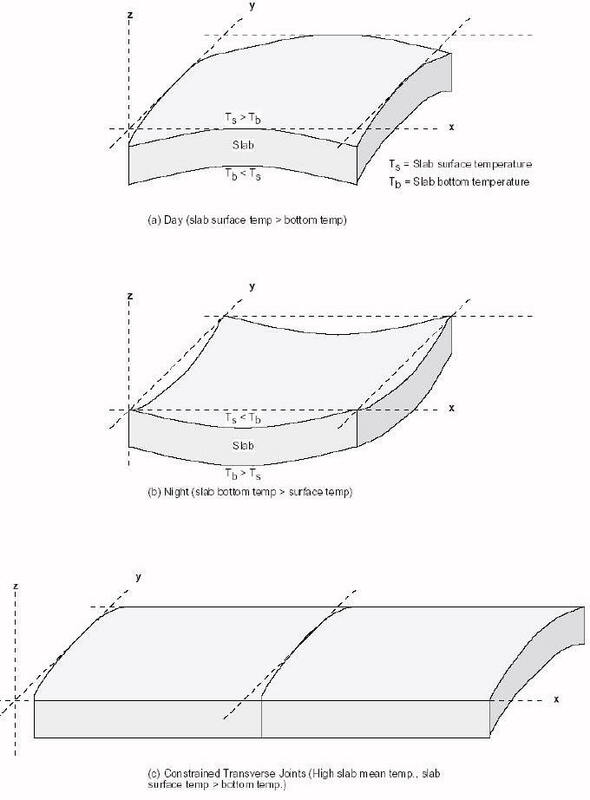 Therefore, slab curling calculations seek to find the points of maximum tensile stress as the slab curls due to temperature gradients within (Figure 1). In 1935, measurements reported by Teller and Southerland of the Bureau of Public Roads showed that the maximum temperature differential (hence, maximum curling and maximum tensile stresses) is much larger during the day than during the night. Therefore, the daytime curling stresses are usually most limiting. Figure 2. Curve showing variation in the differential temperature stress coefficient C for different values of the ratio B/l (redrawn from Bradbury, 1938). Interior loading. Occurs when a load is applied on the interior of a slab surface which is “remote” from all edges. Edge loading. Occurs when a load is applied on a slab edge “remote” from a slab corner. Corner loading. Occurs when the center of a load is located on the bisector of the corner angle. Note that all three equations involved the depth of slab (h) squared. 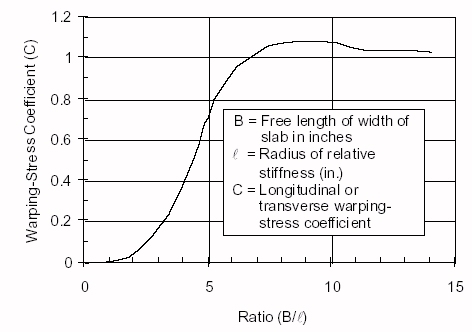 This suggests that slab thickness is very critical in reducing load stresses to acceptable levels.